Coffee at the Cosmo on Thursday, April 21, is entitled, “First in Space: Yuri Gagarin and 50 Years of Spaceflight.” It is at 9 a.m. at the Cosmosphere and is free and open to the public. Russians were first into space on April 12, 1961, when Gagarin’s Vostok spacecraft completed an orbit of Earth. 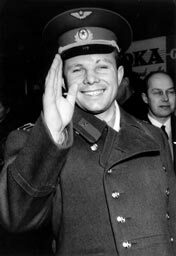 As the first human in space, Gagarin became an international celebrity. However, that was to be his only spaceflight. Seven years later, while on a routine training flight, he died in a crash. His body was cremated and the ashes buried in the walls of the Kremlin on Red Square. The Kansas Cosmosphere has the largest collection of Russian space artifacts outside of Moscow, including a flown Vostok. Gagarin’s flight spurred Kennedy’s famous speech a few weeks later when he declared the US would put a man on the moon, and return him safely, before the end of the decade.